Treat your employees’ pain with a mix of on-site therapy sessions with the education programs and technology solutions that will leave them PainFree™. Are you seeking a quality injury prevention resource to help address your rising workers’ compensation and healthcare costs? Our comprehensive PainFree™ Treatment program brings DORN Specialists and Providers on-site to deliver several levels of pain relief support. All our sessions last between 15 and 30 minutes, and we help employees no matter their levels of pain or discomfort. Our treatments even improve sleep patterns and boost productivity. Help your aging workforce reduce their number of sick days by providing practical therapy that works. DORN’s programs range from practical pain mitigation, when conditions are at their worst, to early intervention when common aches and pains cut into performance. Help your employees recover from musculoskeletal conditions in their backs, their arms and legs, their knees and their shoulders. Our Specialists help reduce absenteeism, improve employee performance and cut soft tissue recovery costs by a minimum of 50%. Sometimes your employees’ pains are debilitating, and sometimes they’re minor discomforts that grow into major aches and pains. 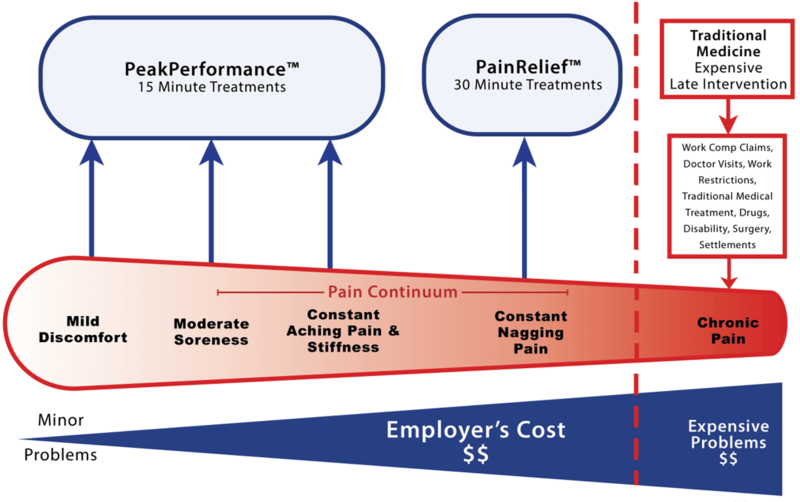 The Pain Continuum graph helps you to understand all levels of worker’s pain and why you should help to address small injuries before they become big problems. Soft tissue, pain muscle claims can cost more than $20,000 to resolve. And that is just the direct cost. The indirect cost can be up to five times that figure. It’s the small aches and discomforts that turn into costly workers’ compensation and healthcare claims over time. When you treat all your employees’ minor pains early on, you can reduce workers’ compensation and healthcare costs by as much as 90%. Convert bad posture and lifting behaviors into pain-reducing techniques—give your employees the tools they need to reinforce stronger habits. Track your employees’ road to health and understand the nature of your workforce’s pains and musculoskeletal disorders. Speak to a DORN representative about how PainFree™ Treatments can help your workers stay on the job and productive.